The golden eagle and the bald eagle have been protected species of birds specifically included in the federal Bald and Golden Eagle Protection Act. Yet in the movement to promote wind energy, the enforcement of this law has been less than direct. Case in point, the company EDF Renewable Energy, which has a 102 megawatt wind power system, is being pressured by the federal government’s Fish and Wildlife Service to accept an agreement that would limit the number of eagle deaths to five over a five year period. Because wind energy companies are not required by the law to adhere to the Bald and Golden Eagle Protection Act, EDF is being asked to accept the terms within the definition of “takes” as defined in the agreement. 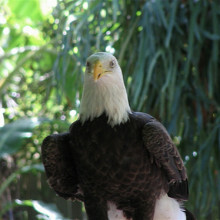 “’Take’ means to pursue, shoot, poison, wound, kill, capture, trap, collect, destroy, molest or disturb eagles, their nests or their eggs.” This would effectively minimize the numbers of bird deaths and still allow EDF to be profitable while moving forward with California’s plan of meeting one-third of the state’s energy requirements using renewable energy sources. This is one of several ongoing actions to limit the environmental damage energy developing companies often ignore in the pursuit of profitability. Electricity Providers in Texas and many other states have become increasingly dependent on wind energy for providing power. For more detilas on this story, go to http://www.earthtechling.com/2013/09/wind-farm-pressed-to-protect-eagles.